Yesterday I got advise. A successful artist stopped by Pirates Alley and told me to raise my prices. Later, a lady who ran several galleries told me that I needed to make simple, small pieces in muted tones that would work with anyone’s decor and sell them for $20. She gave many examples of artists who did very well for themselves by doing this. Sigh. Another artist told e to stop making paintings of faces, but rather do scenes of New Orleans. Well, discouraged but willing to try something new, iheaded home to cut up some canvas into small pieces and paint birds on them. I don’t want to starve, but i don’t want to hate what i make. As a last ditch effort, I took out my long neglected oil paints and finished this piece I’ve been putting off. It was so much fun! I had forgotten how free it feels to paint with oil! 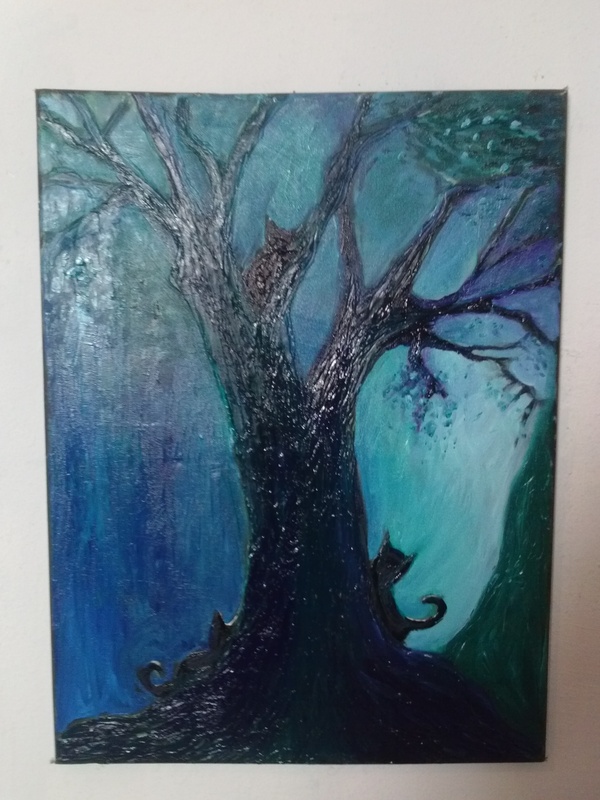 This entry was posted in Maria Kramer Singing Clips and tagged art, black cat, cats, maria kramer, new orleans, new orleans art, oil painting, originals, tree art by Maria Kramer. Bookmark the permalink. keep up the your good work…it’s truly beautiful!